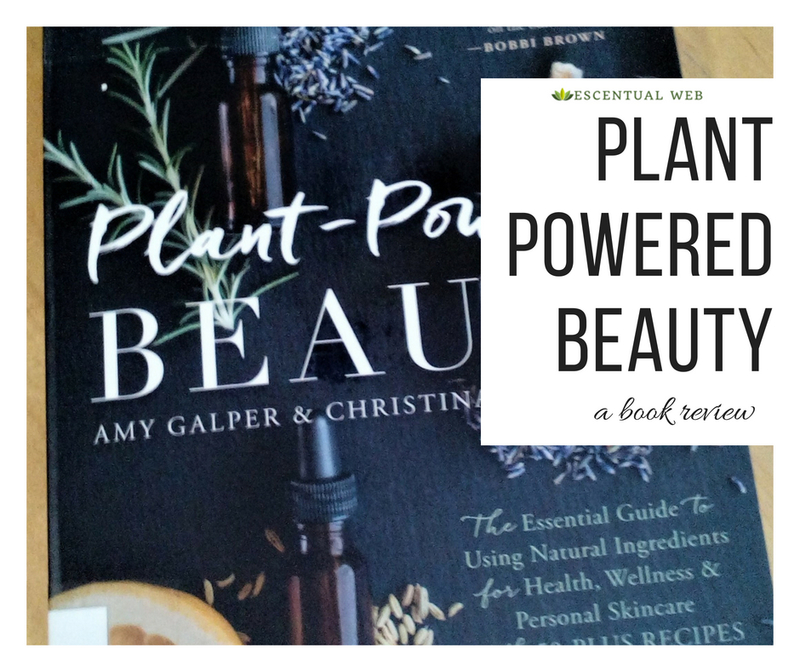 Plant-Powered Beauty was released in Spring 2018 and is one of the latest books offering recipes for DIY beauty. Like most books in this category, it is roughly divided into two parts. The first reviews ingredients, tools, and best practices when making your own products. The second section contains 50+ recipes for face, body, and household uses. Let’s dig into it a little deeper. 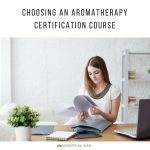 Amy Galper is the director and founder of the New York Institute of Aromatherapy, and co-founder of the New York Institute of Aromatic Studies. She is also a formulator and her brand is Buddha Nose, which is an organic body care line. She has many other accomplishments including appearing at trade shows, on TV and in mainstream media publications, and as a guest lecturer in other schools and universities. Christina Daigneault is an attorney and certified aromatherapist, and is president of Orchard Strategies, a public relations firm and literary agency. She completed her aromatherapy certification through Amy’s school, the NY Institute of Aromatherapy. Chapter 1 Deconstructing Beauty Labels. This chapter discusses the question what constitutes a “natural” ingredient? It then walks us through some example beauty labels to help us understand how to determine for ourselves what is in the product and what role the ingredients play. They discuss the function of ingredients in the formula and on the skin, and differentiate between foundational ingredients, supporting ingredients, functional ingredients and additives/harmonizers. Chapter 2-3. The next few chapters are short, ranging from a couple pages to nine pages. Chapter 2 and 3 briefly cover the difference between natural and organic, and the difference between formulating a recipe and following one. Chapter 4 reviews how the skin works including its main functions, the layers of the skin and their composition, and special considerations when formulating for different skin types. Chapter 5 discusses plant extracts and plant parts. We often think of essential oils as the therapeutic star of our formulations, but beneficial compounds can be extracted from plants in many ways. We can use hydrosols, and make teas and decoctions from plant parts. This chapter reviews the different methods of extracting plant material. Chapter 6 is all about essential oils and synergies. After briefly explaining what each of those is, 29 beauty synergies are given. These are used in the various recipes in the book. While many recipe books will give each individual formula in the recipe, this book’s approach is to create a few master blends of synergies in advance that you can add to your products later. This is an interesting approach as the blends will have a longer shelf life than the products you make with them. Therefore, creating some master blends not only allows you to shortcut re-making your product, but you can re-use the same blend in a variety of products. What follows is roughly 70 pages of ingredient descriptions laid out in 2 page tables. The essential oil section contains columns for method of extraction, physical and emotional therapeutic benefits, and notes. The therapeutic benefits mostly relate to skin care, but there is brief mention of actions such as thinning mucus or reproductive health. Given that this book was written by aromatherapists, I felt the level of detail in the essential oil section was lacking. I also would have hoped that since this book is about beauty recipes, the focus would be on skin and topical applications of essential oils. One fantastic inclusion in the essential oil tables is a list of substitutions for each oil. The carrier oil section is much more useful, covering absorption rate, color, viscosity, shelf life, and safety. There are dedicated columns for where it is sourced from, extraction method, processing, vitamin content, essential fatty acid content, features, and therapeutic actions. At the end of the carrier oil section are several pages with instructions on making and decanting an herbal infused oil. Example of the ingredient tables. The next section of ingredients is hydrosols and describes skin types, plant parts, color, shelf life and safety. There are columns for where it is sourced from, extraction method, main features, and therapeutic actions. I love that hydrosols are included as they are just starting to see a little more light of day in popular use, and not many books incorporate or discuss their benefits in skin care to the extent this one does. The section on butters and waxes is prefaced by explaining some of the refining and processing terms associated with butters, including refining, deodorizing and bleaching. About butters and waxes, we are given the skin types, color, plant part used, shelf life, and safety as well as location of sourcing and method of extraction. Typical processing, highlighted features and therapeutic actions round out the table. Four clays are described including skin types, color, shelf life, safety, sourcing, extraction, features and therapeutic actions. A section on exfoliants follows with all of the same details as clays and the addition of a column on processing methods. Herbs and spices, flours and grains, and fruits and vegetables charts also have information on skin types, color, shelf life, safety, sourcing, extraction, processing, features and benefits. The final section is other ingredients which includes things like aloe vera, castile soap, honey, alcohol, etc. All of the same features are covered with the addition of viscosity information. 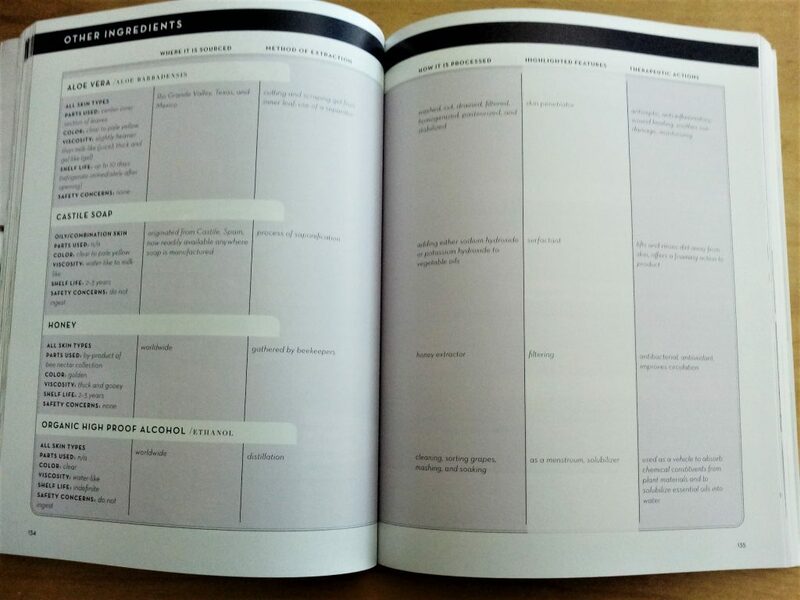 While many natural beauty books describe ingredients, few lay them out concisely in a table format like this. I find this very handy when formulating my own recipes or making substitutions as it makes it easy to find an ingredient that will do what I want. I feel like it may have been a little more user friendly to not break up the ingredients into so many small subcategories (e.g. herbs, grains, fruits, clays, others. The reason is if I want to look up an ingredient, I have to stop and think what category will I find this in? 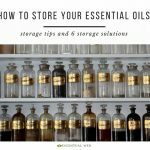 Broader groupings of essential oils, carrier oils and butters, and everything else with each arranged alphabetically might be easier to use, although as I outlined above, not every ingredient category has the same information given for it (e.g. not all categories discussed processing). 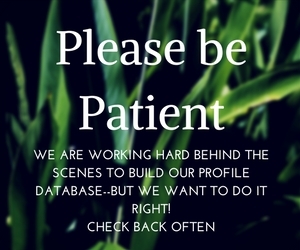 The final chapter of part I goes over the tools and supplies you will need, how to keep your products and workspace sanitary, and the use of antioxidants. Part II is the section of beauty recipes. These are divided into categories and subcategories. The first section is recipes for facial care and includes cleansers, masks, scrubs, moisturizers, and special treatments. This last sub-category includes a recipe each for makeup remover, facial steam, blemish gel, eye gel, and lip balm. Each of the other sub-categories contains 3-5 recipes each. The hair care section has three recipes—two serums and a pomade. The body care section is further divided into cleansers, scrubs, masks, and moisturizers. Each section has 2-6 recipes in it. The moisturizer section includes a body butter, lotion bar, two body oils and two massage oils. The personal care section has recipes for a mouthwash, cuticle oil, spray deodorant, pain relief gel, two different bug sprays, and a hand sanitizing gel. The final section is titled Mind-Body care and includes a bath tea, two inhaler recipes, three roll-on recipes, and two salves. Each has its therapeutic use directed at an emotional benefit such as mood, calming, and mindfulness. Example of a recipe page. The book is in full color with gorgeous photography. 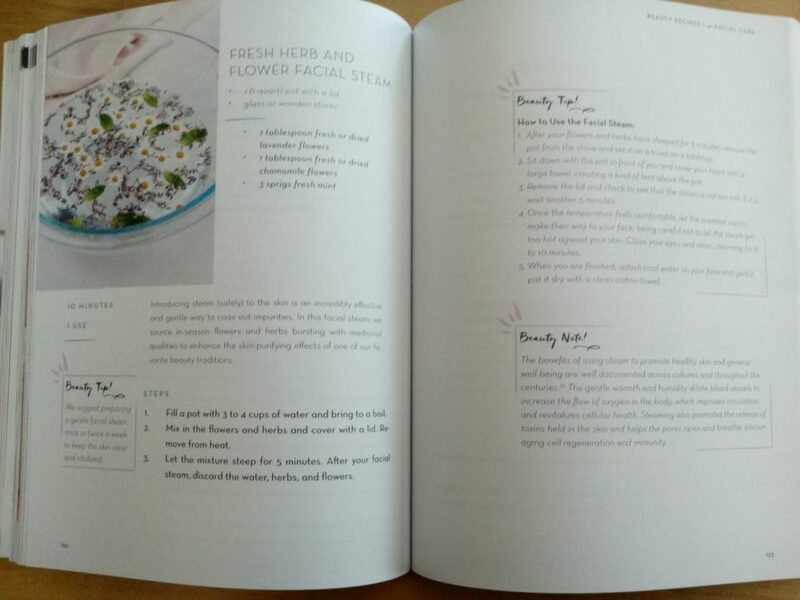 Tips and tricks throughout the book such as instructions on making your own dehdryated fruit powders, as well as mini lessons on various plant components like chlorophyll and beta-carotene. Each recipe clearly states how long it should last. It doesn’t overwhelm with too many choices. Some books have so many variations but this one just gives one or maybe two of each type of product. The recipes are generally simple and don’t require a lot of ingredients or time. To accomplish this, several use castile soap. The recipes take into account texture and consistency and there is some light use of gums as thickeners. Many books and internet recipes don’t consider this aspect of a formulation. All the recipes are preservative free. For many this will be a pro, but it means that each recipe with any water based ingredient is meant to be used immediately or within a few days (the oil based recipes have shelf lives up to 2 months). For me, I am too busy to make up a new batch of something every time I want to use it. The recipes do not make it clear if they are best suited for a specific skin type. Some mention it in the description if you read it through, but many recipes do not. Despite a lot of attention given to ingredients, this book does not give any insight into how to use that information. We do not really learn how to substitute ingredients or formulate our own recipes. This is a fault of almost every natural beauty book (except one, and I will be reviewing that one soon!). Why tell me all of this information on what the ingredients do and then spoon feed me the recipes? Overall, this is a beautiful book written by an author who knows her stuff and despite a few objections stated above I feel it is a solid choice when compared to the rest of the field. For the budding formulator, it is worthwhile as a reference for the ingredients tables even if it doesn’t divulge how to apply that knowledge to a recipe (maybe you need to take Amy’s course for that!). For the sake of Part II—this book is great for someone who wants a comprehensive collection of DIY beauty recipes that doesn’t overwhelm. For the sake of the ingredient tables in Part I and the tips and tricks scattered throughout, this book would make a great reference for anyone wanting to experiment with creating their own recipes and wants an easy way to check on ingredients. If you have a specific skin type or skin condition, there are no specialized variations or recipes for eczema, acne, etc. A few essential oil synergies are aimed at aging or cellulite, so you could swap out the essential oil blend used in a recipe to match your needs.